The Kachin Independence Army (KIA) said today that government forces have launched assaults on several positions across Kachin State, including rounds of artillery directed near the Kachin army’s headquarters at Laiza on the Sino-Burmese border. Speaking to DVB by telephone earlier, KIA spokesperson Dau Kha said that the Burmese military started shelling its positions near Laiza before Christmas Day, however the assault ceased over this weekend. “I think the Tatmadaw [Burmese military] are just biding their time before they attack us again. I don’t think they will stop until they achieve their goal,” he said, without elaborating on what he believed the military’s objective might be. The Kachin army spokesman also reported renewed fighting between government units and the KIA in the Kachin townships of Tanai and Hpakant since 30 December. He said the fighting in Tanai Township is focused on an area near local amber mining projects. Dau Kha said that thousands of villagers have abandoned their homes in Sha Dhu Zut village, Hpakant Township, and have taken refuge in local churches. Likewise, he said, villagers in hamlets around Tanai town have taken refuge in the main town as fighting escalated. In June, fighting between the Tatmadaw and the KIA was preceded by air-dropped leaflets by Burmese aircraft warning the civilian population to leave the area. About 1,000 miners and their families who had been living at local extractive gold and amber sites fled to Tanai town at that time. The Burmese military authorities have since barred the opening of camps in the area for fleeing villagers, known as internally displaced persons or IDPs. The move has been widely resisted by the Kachin Baptist Convention and other Christian organisations who have banded together to provide humanitarian aid to those who have been forced by war to abandon their homes. DVB reported in September that IDPs in the Tanai area were facing grave food shortages. Khon Ja, a coordinator from Kachin Peace Network, said that the situation for IDPs could worsen while the military refuses to allow IDP camps to be established. KIA spokesperson Dau Kha told DVB today that the Kachin rebels had not yet had an opportunity to raise the matter of the current clashes with the Myitkyina-based Peace-Talk Creation Group, which frequently mediates negotiations between the KIA and government forces. The KIA has declined to sign a nationwide ceasefire agreement (NCA) with the government since 2015. 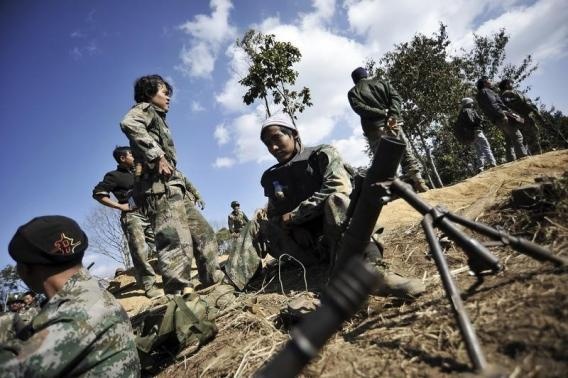 Another non-signatory group to the NCA, the Shan State Progressive Party/Shan State Army (SSPP), has also reported fighting with government troops. It said the clash happened on 1 January ­in Mongshu Township, southern Shan State. Neither side has released any information regarding the hostilities.